About half of Facebook users would pay to subscribe to a version of the popular social network that doesn’t collect their data or target them with advertising, found a survey of users conducted by Research Intelligencer and Pollfish. The survey, which was conducted last week, was done in the aftermath of revelations about Cambridge Analytica’s breach of Facebook user data, and Congressional testimony by Facebook CEO Mark Zuckerberg about steps the social network is taking to protect its users’ data. 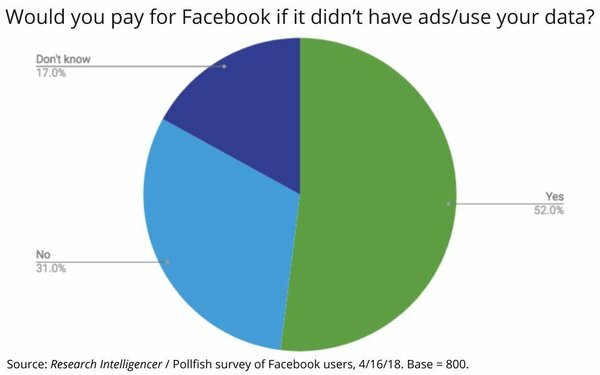 Interestingly, slightly more than half the respondents also said they would pay to buy their data back from Facebook. Asked how much they would pay to subscribe annually to an advertising- and data-free version of Facebook, most respondents cited values under the $100 per year experts estimate Facebook would need to charge the average American. Detailed results, including the amounts people would be willing to pay, are available at Research Intelligencer. 4 comments about "Half Of Facebook Users Would Pay To Subscribe And/Or Buy Their Data Back". Ed Papazian from Media Dynamics Inc, April 24, 2018 at 10:52 a.m. This finding comes as no surprise as paying , say, $6-8 per month, is not such a high pricce for dedicated FB users to deal with once they become addicted to this service. I assume that FB is at least considering a pay with total privacy package as this, in combination to what it now has, might solve many problems and set up a model for social media in general. Yes, it might just be that total ad revenue losses would, at the outset, exceed the added income of having many subs of the total privacy variety----but the looming alternative may well be very tough governmental regulation that has the same or much worse long term impact on profits..
Douglas Ferguson from College of Charleston, April 24, 2018 at 11:06 a.m. It's easier to say you'll subscribe than to actually pull the trigger. The road to accurate consumer research that measures "intention to buy" is littered with debris. Joe Mandese from MediaPost, April 24, 2018 at 11:12 a.m.
@Douglas Ferguson: The study doesn't purport to be anything it's not. It's a survey asking Facebook users what they would do in a hypothetical environment, not what they've actually done. You'd need something empirical to measure that, like behavioral or observational data. Also, the action currently is theoretical, because Facebook is not offering a paid version, so all you can do is ask. If you consider that "debris" or "innacurate," feel free to ignore it. Also, read the note at the bottom of every Research Intelligencer newsletter. It explains our use of "research." Paula Lynn from Who Else Unlimited, April 25, 2018 at 3:57 p.m. They will not get their data back. Hello !